America lost one of its last living presidents on Nov. 30. George H.W. Bush sadly passed away at age 94, just seven months after losing his beloved wife, Barbara Bush. George H.W. Bush , the 41st President of the United States, has died at the age of 94 on Nov. 30. His health had been failing in his old age and he had been in and out of hospitals earlier this year. His death comes seven months after his beloved wife of 73 years, Barbara Bush , passed away in April at the age of 92. His longtime spokesman revealed that the president passed away at 10:10pm CST but did not give a cause of death in the brief statement. Funeral arrangements are pending but no doubt our remaining living Presidents Barack Obama, Bill Clinton, Jimmy Carter and of course HW's son George W. Bush will be in attendance. President Bush was admitted to the hospital on April 22 — just one day after burying his beloved wife of 73 years. 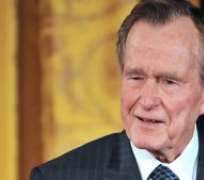 Bush, according to the family spokesperson, was taken to the intensive care unit at a local Houston hospital after a severe infection spread to his blood, causing sepsis. Though he said he seemed to be improving and on the road to recovery, he sadly took a turn for the worse and ultimately passed away months later. Despite his age, Bush was known for being spry and resilient. He even went skydiving in his 80s! He suffered a severe neck injury in July 2015, but managed to heal just fine. In 2017, his health sadly declined, landing him in the hospital on January 14, 2017, after suffering shortness of breath which was later diagnosed as pneumonia. He was hospitalized again on April 18, 2017, when he came down with another “mild case” of the illness . His contributions to the United States didn't just come from his time as president from 1989 to 1993. A Republican, Bush also served as vice president to Ronald Reagan, was a congressman, a Director of Central Intelligence, and an ambassador. Before his time in the White House, Bush was a member of the US Navy, fighting in World War II from 1943 to 1945. He loved his country and served it well. Statement by the Office of George H. W. Bush on the passing of the 41st President of the United States of America this evening at 10:10pm CT at the age of 94. Bush also remained concerned about his party's well-being, which was much appreciated by Republican politicians and civilians alike. When he made an appearance at the February 25, 2016 GOP debate, he received two standing ovations for his contributions to the party. The former president is survived by children George W. Bush, Jeb Bush, Neil Bush, Marvin Bush, and Dorothy Bush, as well as 14 grandchildren and great-grandchildren. Our thoughts are with his loved ones as they mourn.